Bogs, wet conifer swamps, wet thickets, and swales; margins of ponds, lakes, and streams. Usually easily recognized by its wet habitat, curved infranodal prickles, and very finely and evenly serrate margins of the leaflets (ca. 20 or more teeth on a side of the larger leaflets). The flowers are very fragrant. The sepals (as in R. carolina and R. arkansana among our native roses) are often ± pinnately lobed, as in most of our garden species. In R. blanda and R. acicularis, only very rarely is there a hint of such lobing. 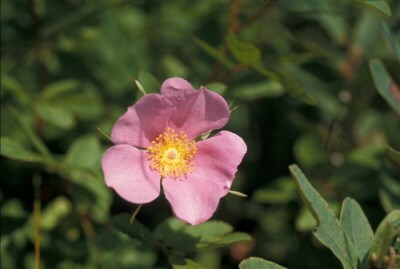 Rosa palustris f. inermis (Regel) W. H. Lewis lacks the characteristic stout curved infranodal prickles. Such plants can be recognized by the leaf margins and glandular-hispid hypanthium. Hybrids with R. blanda are discussed under that species. MICHIGAN FLORA ONLINE. A. A. Reznicek, E. G. Voss, & B. S. Walters. February 2011. University of Michigan. Web. 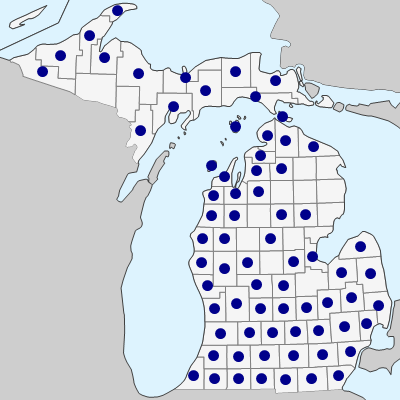 April 21, 2019. https://michiganflora.net/species.aspx?id=2544.